Heat a saucepan until hot and add a knob of butter. Sweat the shallots and bacon until the shallots are soft. Add the garlic and cook for a minute before deglazing the pan with the white wine. Reduce the wine by half and then add the braising stock to the pan. Reduce this by half, lower the heat and then gradually whisk in the remaining butter until you have a glossy sauce. Finish the sauce by adding the peas, chopped mint and a squeeze of lemon juice. Heat a frying pan until hot. Season the duck breasts with salt and place in the pan skin side down. As the fat melts, drain from the pan. Continue until the skin is golden brown and crispy. Turn the duck breast over and seal all of the raw meat. Cook on the flesh side for a further 3-6 minutes until the duck breast is slightly firm to the touch. Allow to rest for 5 minutes before serving. Whilst the duck is resting, reheat the potatoes adding the parsley at the last minute. Warm the lettuce in the oven and gently warm the sauce. Place a large quenelle of mash to one side of the plate. Place the baby gem alongside. 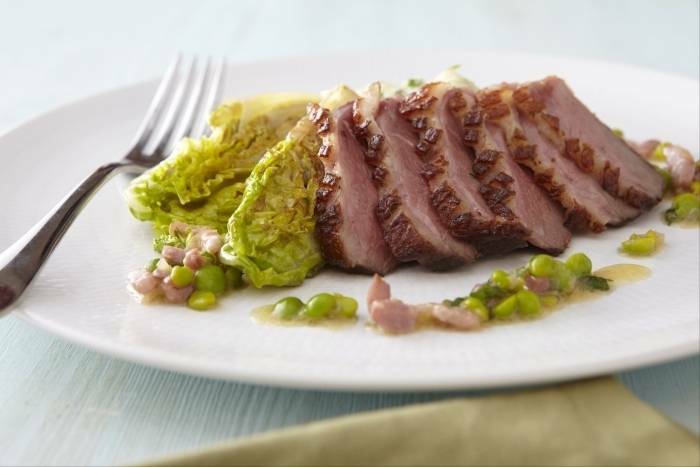 Slice the duck breast into 6 slices on the angle. Arrange this on top of the gem. Spoon the peas and sauce around the plate.